Your termination quota's exceeded, but your happiness index is still way down in the doldrums of despair, and your loyalty index ain't looking too good. Total Security means that everything's tracked and monitored, including your own dwindling chances of survival. There's a whole sector of traitors out there, and your gun won't fire until the next business day. You've got the BLUE clearance blues. A 32-page mission for IntSec Agents. 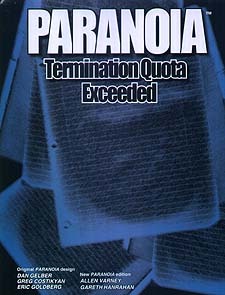 Paranoia: A light-hearted game of backstabbing, treachery and guile, where trusting other players is a sure route to the termination centre.